There are plenty of ways for politicians to embarrass themselves (getting busted for foot-tapping comes to mind), but few are as public as bouncing the ceremonial first pitch at baseball games. Yesterday President Obama announced that he would be making his first first pitch as Commander-in-Chief in two weeks when he'll take the mound before the MLB All-Star Game in St. Louis (in 2005 he threw out the opening ball as a U.S. Senator (above) at a playoff game for his beloved Chicago White Sox). 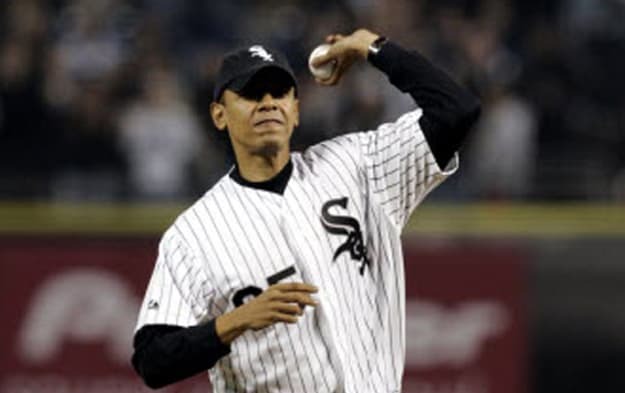 • If Obama fudges the first pitch this badly, he&apos;ll have to answer to the Special Olympics again. • To be fair, the veep had them ban beer sales during this game so the ovation has nothing to do with his politics. Nothing. • We&apos;re not sure which one in this father/son duo actually tossed the first pitch, but we know that mess was weak. Underhanded? Really? • Best. Throwing. President. Ever. Yee-haw! • Wow. Obama is so much cooler than this guy. • Biden&apos;s got a history of shooting himself in the foot, so we&apos;re a little surprised he actually got off a decent pitch here.